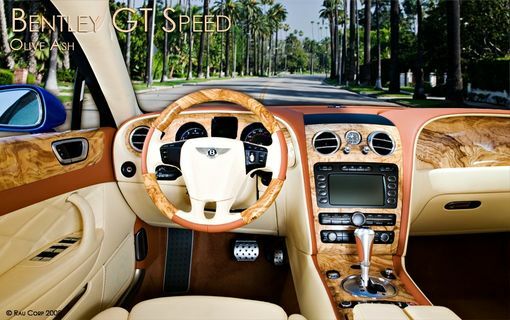 The GT Speed was introduced in 2007 as a high performance version of the Bentley Continental GT and the 4-door Flying Spur. One of many new GT Speed features was a sporty 3-spoke steering wheel as opposed to the traditional 4-spoke. Since a Speed wheel dressed in matching wood is not a factory option, where do you go to satisfy such a request? As this dealer and many others know, for unusual one-of-a-kind custom wood requests, the solution can be found at the West Los Angeles studio of William Rau. 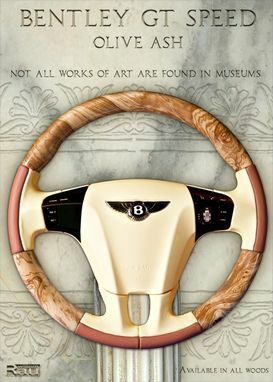 From the signature steering wheels to full interiors in woods and carbon fiber, enthusiasts, dealers and manufacturers utilize the firm's artistic and technical expertise to render unique designs. What makes a 3-spoke wheel different from the traditional 4-spoke is that it has one of its spokes at 6 o'clock, which precludes wood from being placed in that area. The options for wood placement are a large solo section on the top, or that, with additional wood segments to the left and right of the bottom spoke, thus making it a three piece wood wheel. The job became a bit more challenging than other steering wheel makeovers in that the lower two pieces are tapered so they are larger at the bottom and taper up to a smaller width. New patterns and templates had to be developed to replicate the shape of the original leather and rubber combination. 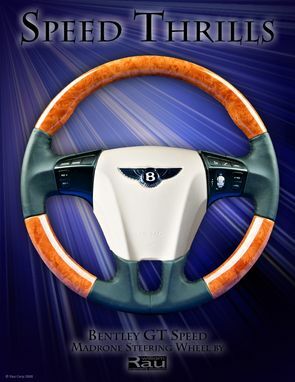 This particular wheel became the first wooden Bentley GT Speed steering wheel available in the world! To see additional details of this steering wheel and more projects, please follow the personal website link to our blog.